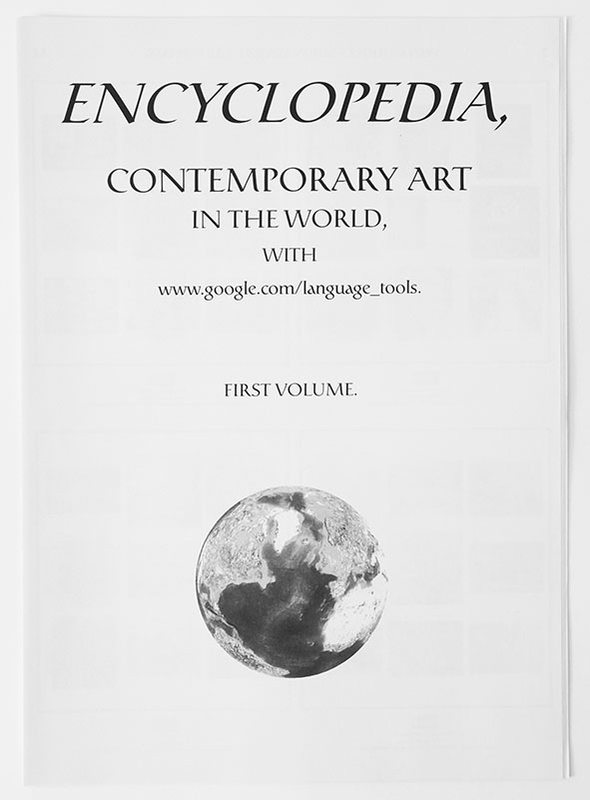 Encyclopedia, contemporary art in the world, with www.google.com/language_tools. First volume. Edited by Éditions Incertain Sens, Rennes. Co-production : Centre Culturel Colombier. 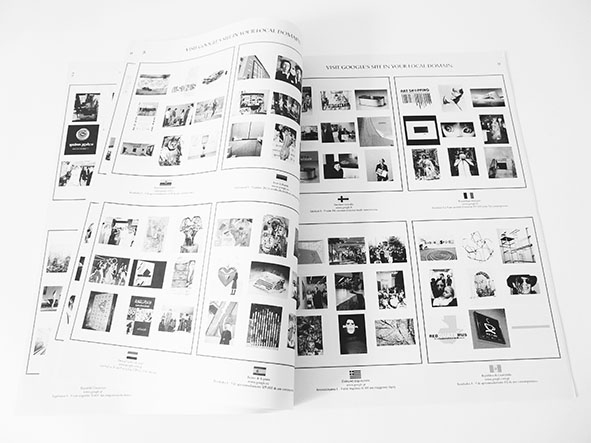 1000 Copies, 28 Pages A3, black , offset. 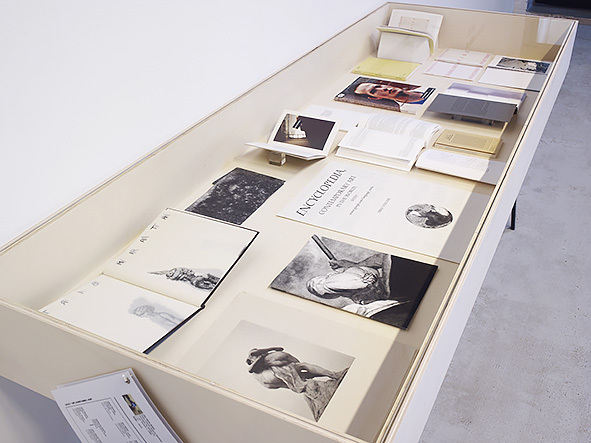 Public Collection – FRAC (Fonds Régional d’Art Contemporain) de Haute-Normandie, Sotteville-lès-Rouen, France. Bibliologie, L’Artiste en Iconographe, Curator Jérôme Dupeyrat, 2014, FRAC Haute Normandie, Sotteville-Les-Rouen, France. «In the mid-eighteenth century, The Encyclopedia of Diderot and D’Alembert proposed to collect all the knowledge of its time. By limiting its ambition to knowledge generated by the idea of ​​ »contemporary art », ENCYCLOPEDIA offers to represent such a project in the age of Google. The site http://www.google.fr/ language_tools, each local domain (France « . fr » England « . uk » Germany « . de ‘, etc.) is used to make a Google search. The term « contemporary art » has been translated into the language most spoken in every country from which a search has been made. Some countries such as Iran, have no Internet domain – even if Google allows translation to Farci (Persian language) A search was then conducted for the six languages related to the countries that have no domain. 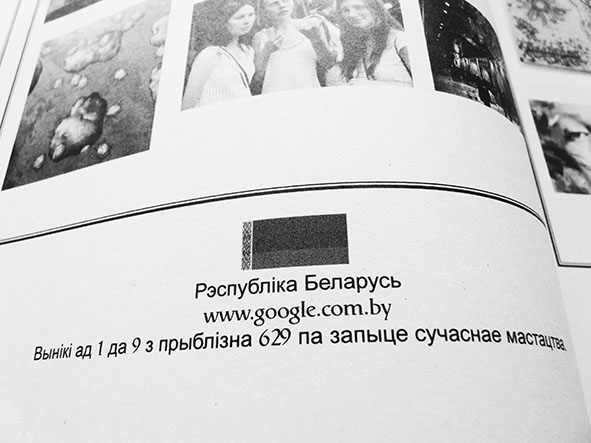 Inside the back cover are listed areas that do not offer the possibility of a specific search, as well as those where there is no possible translation with Google’s translation tool. The first nine images displayed by the search engine in each area were selected for publication. Passed through the Google logic, these images without captions then become only images of themselves. The idea of ​​the encyclopedia, the main idea in Jean-Benoît Lallemant’s project, allows a glimpse of the limits of knowledge when the Internet is the only tool used : the images replace the concepts, the order of appearance of Google’s response depends on their popularity, the result is no longer the same from one day to another, etc.. The definition of concepts is no longer possible because the search engine does not meet demand, but gives a arbitrary image of contemporary art. The encyclopedia then becomes a continuously updated report. The Internet, on which Google is one of the main tools promises a look at the whole world and knowledge, but offers perhaps a globalisation: the Westernisation of all cultural forms.» Leszek Brogowski, President of Edition Incertain Sens.